Hooray for the allure of French Polynesia! It convinced long-time friends Karen & Jon to come back and visit a second time. 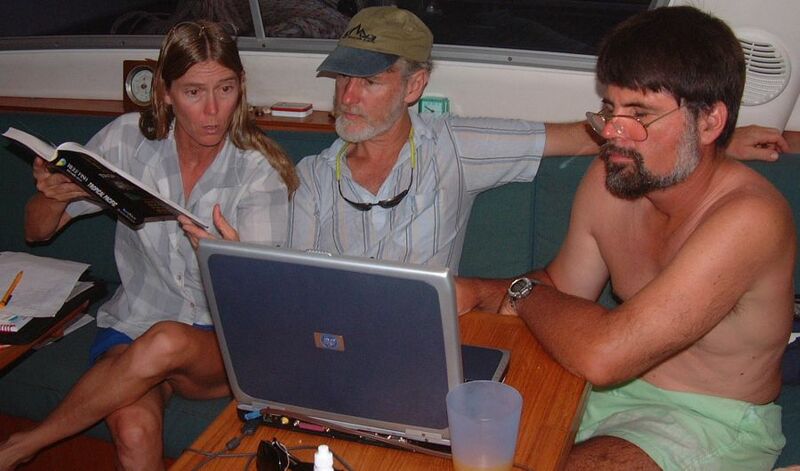 After our stay in the States, we returned to Ocelot in mid-January, 2004, having only 2 weeks to clean up, repair, and move Ocelot up to Maeva Beach, Tahiti. Then we could meet Karen & Jon at the airport with all their dive gear and all the duffels of extra goodies (mainly favorite foods) that we hadn't been able to fit into our own duffels! Dividing our time between water adventures and land adventures we packed a lot into our first couple weeks together. It took a few days of Le Truck (the local bus) rides in and out of Papeete to get our French visas sorted out, and Karen & Jon gamely went along for the rides. Their first Sunday with us we rode Le Truck into town and then walked for an hour through the back streets of Papeete to the beginning of the water company trail. This shaded, flower-lined walk leads inland up a valley on a broad grass trail for several miles, then breaks off to a foot-path that climbs high on the side of a steep mahogany- and Tahitian chestnut-covered hill to a beautiful waterfall. We swam in the cool water, slid down a few smooth rocks, and enjoyed our picnic. We made good time back to the streets of town, where we were lucky enough to hitch a ride in the back of a pickup truck (all 6 of us!) and catch the last Le Truck of the evening back to Maeva Beach and Ocelot. The next day we rented 2 cars and explored the whole island. 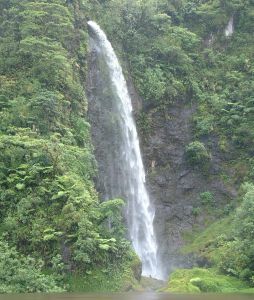 Coordinating actions with little two-way radios we drove west from Papeete and followed the wild Papenoo River inland through lush forest, dozens of picturesque waterfalls and steep volcanic canyons. Although some tourists pay $60 to $80 per person for the thrill of 4x4 bashing up the riverbeds, we found enough challenge in our own little Renaults on the gravel road. In places we crossed the river by planked bridges, but sometimes we got to ford the river, hoping the concrete roadbed was not too slick with algae. If we'd had all day, we might have made it to the top of the cross-island pass, but we'd counted on getting all the way around Tahiti and back in one day. Heading south on the east coast, we learned that the road was under construction and closed until 3PM. Time for a side-track to a waterfall and a picnic lunch while we waited. At Taravao we turned east on the Tahiti-Iti peninsula and found a bit of "old Tahiti." Here the villages are small, just a few houses bordering the road, each with a garden of tropical blossoms and hedgerows of tiare bushes, bananas, hibiscus, Bougainvillea, and plants with wildly variegated leaves. The houses are not fancy, but the people seem to take pride in their gardens. At Cook's anchorage on the northeast corner we watched the local fishing families pulling in the day's catch: a meager offering of small 6-8" (15-20cm) fish. We drove high on the plains above Taravao to see the agricultural and livestock grazing lands with great views of the western reefs of Tahiti-Nui. Like during their first visit to Ocelot, we spent lots of time snorkeling right off the boat. Unlike their last visit, though, all the Ocelot crew are now divers, and the 6 of us spent many hours underwater together. We dove a couple wreck sites inside the Tahiti Lagoon, and on the wall outside the reef. 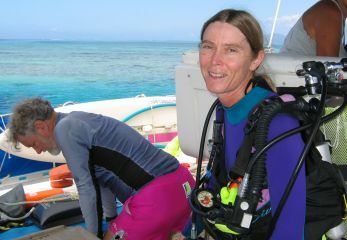 Karen is superb at identifying reef fish, not only from all her Hawaii diving but from diving trips in the western Pacific. She could name many of the more common fish as we saw with them, but those that eluded her we captured on our new underwater camera. Evenings on Ocelot saw all of us gathered round the computer, fish ID book in hand. 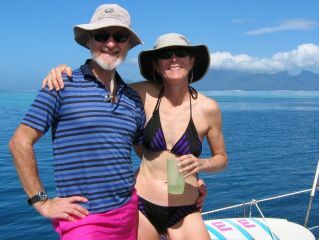 After a week in Tahiti we sailed the 15 miles west toMoorea, anchoring off magnificent Cook's Bay, near the pass, in 12 feet (4m) of clear water over sand. We found good snorkeling here, though the current could run strongly. Scoping out the public transportation, we four adults took a bus part-way around the island to the ferry landing. From there we hiked inland, following the hiking directions in a Lonely Planet guide to French Polynesia. 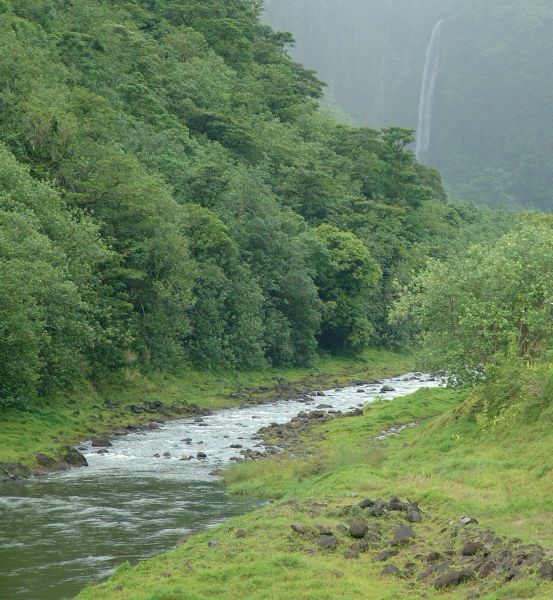 The trail left a small stream and little farms to rise steeply up the forested hillside. At the ridge-line we rested for snacks and great views of the jagged peaks and volcanic plugs that mark the Moorea skyline. We descended through more "mape" forest towards the Opunohu valley where we met the road around Cook's inlet and hiked back to the anchorage. A pretty exhausting 8 hours, but beautiful day in the Polynesian jungle. Karen and both Jons rented bicycles one day and rode all the way around Moorea, bringing home tired muscles, sunburned noses and lots of lovely photos. For their third week, Karen & Jon decided to fly to Bora-Bora for some intensive scuba diving, which was convenient for us, as Chris' friend Vince stayed with us that week. Karen & Jon's last week on Ocelot saw us back in Moorea, this time at the Opunohu anchorage where we did a lot more diving and snorkeling. Their diving in Bora-Bora was less than ideal, as the water was murky from rain and the French dive-masters were a bit too casual with nitrogen limits for nurse Karen. So we tried to make it up, diving almost everyday, sometimes twice a day. Having guests is good for getting us out and making the most of wherever we are.